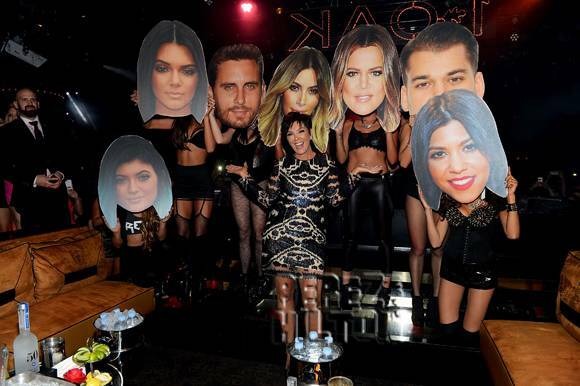 Kris Jenner Is Hanging Out With A Bunch Of Big Heads Of Her Family! We guess cardboard cutouts of your family is better than nothing! Kris Jenner recently celebrated her 59th birthday at the 1 OAK nightclub at the Mirage Hotel and Casino in Las Vegas where she was spotted with her whole entire family! Or, wait, her whole entire family WAS there but it wasn't in person! We meant there were giant cardboard cutouts of their heads! Some of her family and friends who were there in person included Scott Disick, Alec Monopoloy, Jonathan Cheban, and of course her new beau Corey Gamble! We're sure her famous children would've loved to have partied their faces off with their mom, but we're sure they all gave her their own kind of celebration in their own special way! And judging from Kris's face, she didn't seem mind too much. Or at least it doesn't seem that way considering that huge smile of hers that she has in this photo of her and her cardboard family up (above) ! Happy belated birthday Kris! Looks like it was a good one!! !